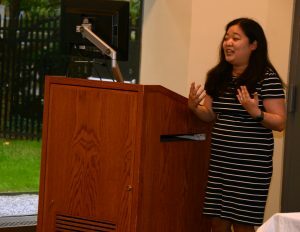 The skills used to acquire master’s and doctoral degrees in the humanities and STEM fields are in high demand in fields beyond academia, a pair of speakers told students on Oct. 2 at the Lincoln Center campus. The panel, “Putting Advanced Degrees to Work in the Twenty-First Century: Academic Associations on Recent Trends in Career Pathways for Humanities and STEM Fields,” was organized by GSAS Futures, a professional development initiative sponsored by the Graduate School of Arts and Sciences and Fordham’s Office of Career Services. It featured Emily Swafford, Ph.D., director of academic and professional affairs at the American Historical Association, and Corrie Kuniyoshi, Ph.D., senior program manager at the American Chemical Society’s (ACA) education division and graduate and postdoctoral scholars office. Real Value in a Ph.D.
As part of her presentation, Swafford highlighted Where Historians Work, a new interactive online database developed by her association that has tracked the career outcomes of more than 8,000 historians nationwide. While she did not discount the challenges that graduates are finding in the job market, she noted that the there are some encouraging trends for students pursuing Ph.D.’s in all the humanities. “When you learn to think like a historian or humanist or a scientist, in addition to the content knowledge you have picked up along the way, what you have learned gives you the ability to have an impact on the world that many others do not,” she said. As proof, Swafford cited date from the American Council of Learned Societies, which has been helping Ph.D. students get jobs through its fellowship program, and has followed up in surveys. In their responses, employers said that the Ph.D. the students had earned was exactly what made them so attractive. “It was the depth of thinking that a Ph.D. brought, it was the ability to quickly acquire knowledge, process information, and consider problems through new angles,” she said. That’s because a Ph.D. bestows what she called “career diversity life skills”: communication, collaboration, quantitative literacy, intellectual literacy, and digital literacy. Through the Where Historians Work database, the association found that 60 percent of participants went onto tenure and non-tenure track teaching positions. For everyone else, a dizzying array of positions await: general and operations managers, chief executives, education administrators, secondary school teachers, lawyers, editors, librarians, curators and writers, to name a few. Swafford said it’s incumbent on students to recognize all these possibilities. “Once we articulate these skills, what we realize is, actually, you need them to be a faculty member too. So, thinking broadly about how to get the most out of your doctoral degree is not just preparation for a career beyond the professoriate. 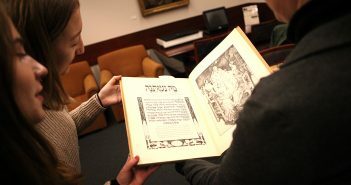 It’s preparation for a career as a faculty member too, which is to say, there’s nothing to lose,” she said. Kuniyoshi said that when it comes to STEM fields, opportunities for employment are overwhelmingly in the private sector. In fact, 71 percent of students who earn a Ph.D. in engineering or one of the sciences will go onto to work in the corporate world, while 18 percent will work in academia, and 11 percent will work for the government. The outlook is very optimistic, she said, as STEM graduates currently have a lower unemployment rate than the general population, and demand is predicted to continue. Of special note is the fact that there is a demand for graduates with science degrees in fields such as policy, law, media, communications, the nonprofit sector, and government. “There’s a real push in our scientific community as a whole to really get away from referring to nonacademic jobs as alternative or nontraditional when in fact the more nontraditional jobs are the academic jobs,” she said. 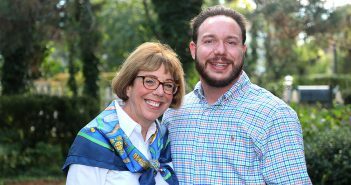 “We tell students, career chemists, and faculty in every workshop we have that the reason this all matters is we can help people find that place where your values, your personal strengths, and the job market opportunities overlap,” she said. 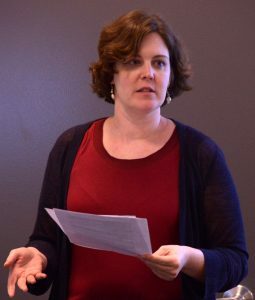 Organizer Christine Kelly, a history Ph.D. candidate and GSAS Higher Education Leadership Fellow, said the forum exemplified the group’s commitment to fostering meaningful dialogue about the value of graduate education in light of shifting trends across job markets.